Eduardo teaches clarinet, bass clarinet and saxophone to all levels of students, with a focus on classical and contemporary jazz classes. He also specialises in improvisation and ensemble training. 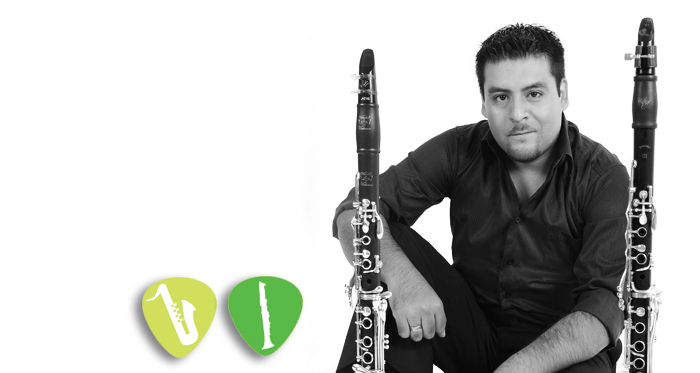 Born in Lima, Peru, to a musical family, Eduardo, at the age of 9 began learning the clarinet, saxophone and percussion. He completed his studies at the National Conservatory of Music of Peru with a bachelor’s degree in the Clarinet. Later he moved to Barcelona to continue his graduate studies and Improvement in the Clarinet at the Conservatory Liceu under the tutelage of Isaac Rodriguez and finished an Arrangements course and jazz ensemble with Sergi Verges. Eduardo is an accomplished musician, having won numerous awards, playing in a multitude of festival and having his performances and music used in films and various other productions. He is a talented soloist and has accompanied Symphony Orchestras in both Peru and Spain. He has been a clarinetist in the Catalan Association of Composers from 2015 and Clarinet Soloist of the Youth Orchestra from 2015.